Ooh, just noticed this thread. I have recently retired from grass-track racing. 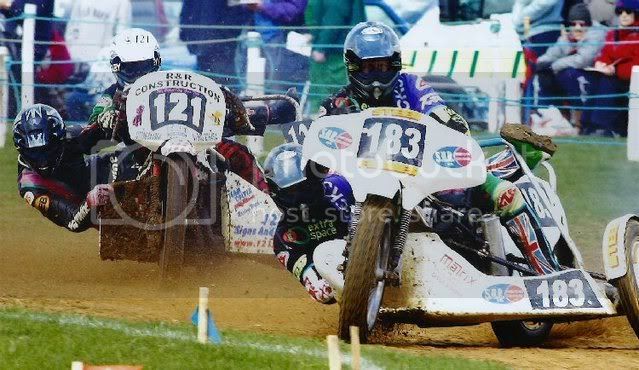 I started out in 250 solos in 1989 and worked up to 500's, I then went on to the 1000cc sidecars riding both grasstrack and speedway. I must admit to meeting many very nice casualty nurses all over the UK during my time racing. I eventually realised I was far too old to be throwing myself around fields every weekend and spending far too much money doing so! I first got the interest in grass-track at the Rhodes Minnis track during the early 60's and remember many of the riders already mentioned, Don Godden and Monty Banks are no longer with us and will be remembered well, Dons son Mitch is now a top rider and keeping the Godden name going. Anybody interested in local speedway can bring back some memories by having a look at www.canterburycrusaders.co.uk a website I set up for a friend a few years ago. A couple of pics of me playing on my Honda Fireblade beasty before I came to my senses. I now keep up my bike interest by having a nice shiny Harley Davidson to plod around on on sunny days. Knowledge is nothing if kept to yourself. Many moons ago I used to be an avid speedway fan (mainly at Wimbledon), before the sport lost is appeal following a number of deaths and dwindling numbers. Grasstrack and long track was always raced but off the beaten track. I mentioned this to one of my old friends who races classic sidecars. I remember going to grass track racing with my brothers. I believe they knew Malcolm Simmons who then become a speedway star. I also remember being at a meeting where some spectators were killed when a sidecar went into the crowd. Does anyone else remember this or is my age catching up with me? Blimey brings back memories. Took my family to meetings at Bredhurst, Rochester Airport, Sittingbourne,Folkestone. Names like Don Godden, Malcolm Simmons, Tony Black, Sid Jarvis, Lew Coffin, Graham Banks, Chris Pusey, John Britcher, Reggie Luckhurst. Sidecar Gerry Wheeler, Mick Webster, Bruce Ford-Dunn, with a Husqvarner engine. Most tracks rode left side, then the riders came from the north and rode right side. The landlord of the Hop & Vine Jake Rennison was a hairy rider in his day. Was a member of the Maidstone Aces for a spell, used to track marshall. Had a spell Start Marshall at Canterbury Speedway and Sittingbourne. I was in the RAF same time as Derek Minter who gave me a lift home on his 350cc BSA. Scarey!. This has got me going. Great times. Speedway existed as far back as my memory takes me - I remember collecting cigarette cards of speedway teams before the war - and has always been on a dirt track in a specially built stadium. so are we talking motorcycles and oval tracks here? predecessor to "speedway" ? Poynter House a long way from Dover. Well a great respose to my query guys. I mostly recall meetings at Lydon track just a huge field with a roped off track in those days 1962/3 seems about right. I recall that Alfie Hagen was the man to beat in those days. Revercing the head on older models is possible with a good workshop i.e revercing the piston or the valves would be missmatched with a std position head, swap head round, head gasket may have to be made up if different size head/barrel studs are there, make up new exhaust down pipe, will now exit the rear, must be in air stream to aid cooling, refit/and rejet carb settings, or will have an ram air fault caused by to much air down its throat causing very lean mixture at high revs poss melted piston. done. Im a sheppy coppers son! Steve Lancefield tuned the Norton engines for Kieft and also the 350 and 500cc engines on the Manx Nortons for the "King of Brands, Derek Minter. I once heard a tale that he reversed the cylinders of Minter`s bikes to increase the performance. I have no idea if this is true and, not being an engineer, I assume the inlet port became the exhaust post and would be interested to know if this is possible. Yes, Kieft was the name - difficult to tell them apart from Coopers. Either Don or Norman Gray, if not both, started work for a Mr Sharman, who ran a cycle and radio shop on the corner of Cazeneuve Street and King Street, Rochester, before the war. Kieft`s the word your looking for peterchall. They had rear JAP or Norton engines and the driver had virtually nothing more than a nose cone in front of him. Kieft drivers that come to mind are Sterling Moss and Don Parker. I think Don and Norman Gray drove Coopers. Another name that I remember is Paul Emryson who drove an Emryson. Brands Hatch was originally a grass track in the 1950's, based on the present 'short oval' course, but I think even shorter, and the direction was anti-clockwise. There were no spectator facilities apart from a grass bank round the course. Main events were 500cc car racing (classed as 'Formula 3'). Cars were mainly Coopers with JAP engines, (but a make called 'Kraft' comes to mind -?). Local "stars" were brothers Don and Norman Gray, eventually running the motor cycle and Asian make (Kia, Mazda, etc) car dealership in Chatham High Street. spring to mind. Then of course the tang of Castrol R and the 'Dope' burned as fuel. I remember watching this at Rochester Airport in the years before the retail park was built, Iwade and somewhere on Sheppey, along with hotrods and banger racing. If I remember correctly, the "track" for both events was seperated from the spectators by little more than rope held up on wooden posts or steel cables and posts driven into the ground??? This form of racing is still going strong. A friend of mine only retired a year or two ago. They used to use a field near Chartham quite a lot, even a mile away the sound was good. 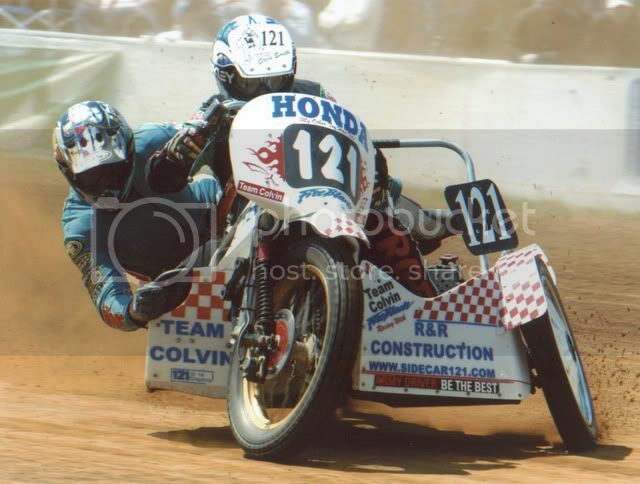 I have given up counting how many times he broke bones, that said he did quite well and ended up at the Brit Nationals and Internationals a good few times. S4. Yes, I remember the grass track racing extremely well, but more in the 50s. It used to take place, believe it or not, on Sittingbourne`s Football Ground which used to be just off the High Street, opposite Woolworth and about 150 yds behind the Bull Hotel. Two more names that I can remember are Arthur Hood (JAP I think) and Jack Colver (AJS or Matchless for whom he worked at Plumstead). They had vastly different styles. Arthur with one foot on the ground and Jack who appeared always to have both feet on the footrests. This was my first smell of `Castrol `R, once smelt (or is it smelled), never forgotten. The ground was surrounded by corrugated iron fencing which in places had rusted and enabled us little horrors to squeeze through the holes. How the ground was prepared for football after being churned up by the bikes I`ll never know. The area was eventually sold to the Co-op for millions but they did nothing with it and sold it to Sainsbury`s at a loss. Happy days!